Tasty and comfortable. This is our hope from the beginning. 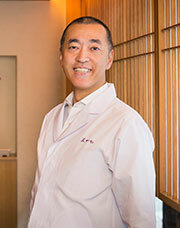 'Kagurazaka Ishikawa' and 'Kohaku' will pursue the best quality which is worth for the pleasant time in the cabin. Please enjoy our collaboration menu which is available only in the JAL first cass. 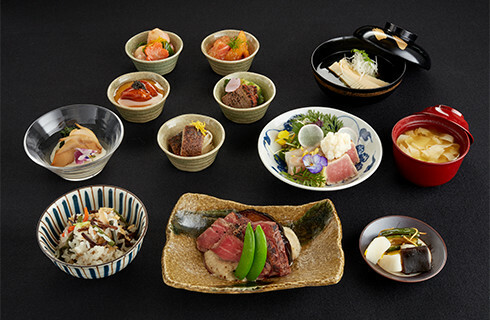 The original taste of each ingredients will be brought out by mixing Japan and worldwide seasonal food ingredients. I am happy as a creator if you find the new awareness such as you find while travelling. Amazed by the foreign food and culture in Paris, living away from homeland made me realize the delicate beauty of Japan. Someday back in homeland, I will let the world know how fascinating Japan is. Now, this growing desire became into reality on JAL Fist Class. 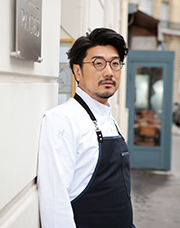 Please enjoy the four seasonal Japanese ingredients dressed using traditional French techniques. 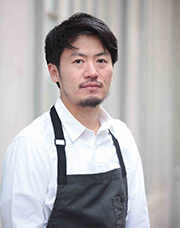 Based on his deep knowledge of local ingredients and cooking techniques both cultivated over his years in the U.S., he puts great emphasis on "ingredients and sauces." 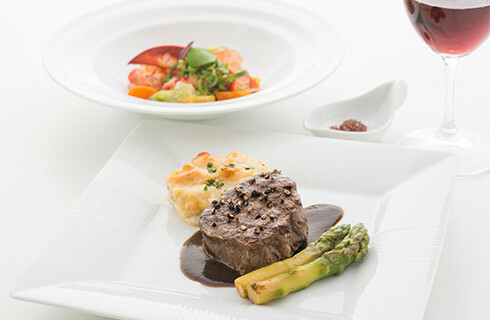 Please enjoy this special menu designed by a culinary professional who has impressed gourmets around the world on JAL flights from New York. At my restaurant I am constantly pursuing how to make the restaurant, how to make my meals something special that is delicious, enjoyable, and where people can have a good time. 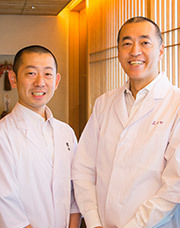 I have applied this aspiration when engaging in JAL�s Restaurant in the Sky. 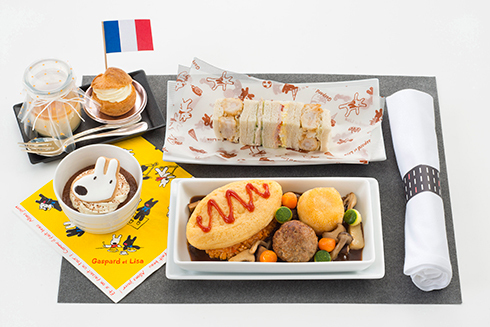 I hope this in-flight meal will bring back good memories as the last restaurant of your trip before landing in Japan. 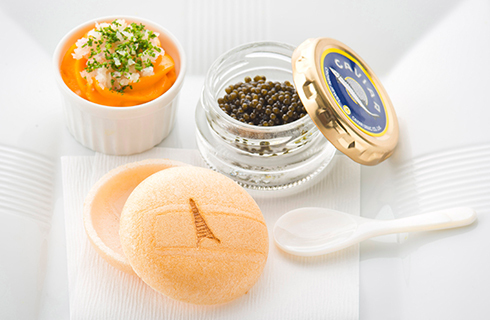 JAL is serving the original menu which is only available in the JAL�s cabin by Chef Teshima pursuing essential taste. 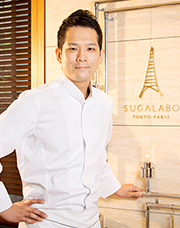 Chef Teshima creates the cuisine from the multiple points of view by using the familiar ingredients. 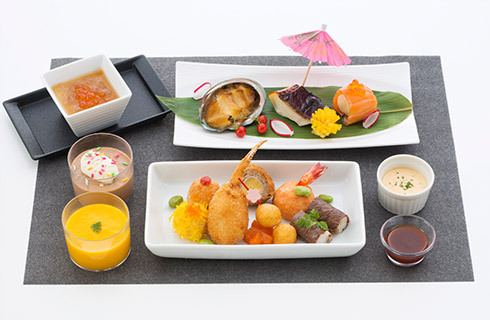 Please enjoy expected in-flight menu which is made by Japanese chef who makes a great deal of Japanese unique taste. 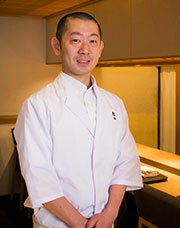 We will serve a Japanese meal created in collaboration with Chef Daisuke Hayashi of the Japanese Cuisine Academy U.K. 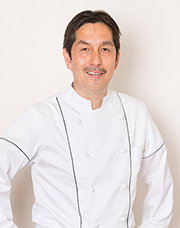 Chef Hayashi was sous-chef at the prestigious high-end Kyoto restaurant Kikunoi in Akasaka, Tokyo, and supervised the Japanese cuisine at the 2008 G8 Hokkaido Toyako Summit. 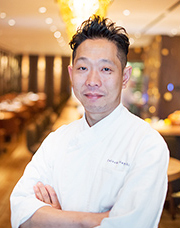 He also has extensive experience working in Japanese restaurants overseas, including his current post of Executive Chef at TOKIMEITE in London. 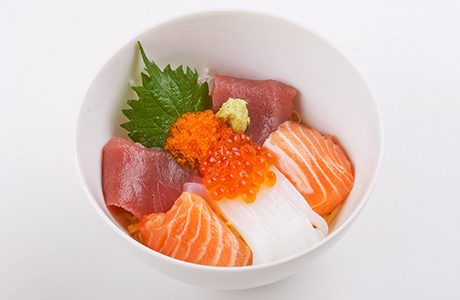 We hope you enjoy his authentic Japanese cuisine abounding in fresh, local ingredients. Enjoy your favorite menu at any time. 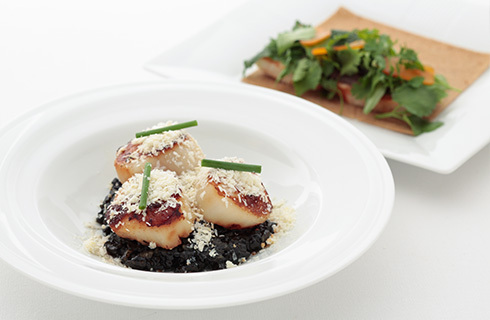 Chef and food producer Fumiko Kono's focus is on achieving "pure healthy cuisine". Rather than diet food or low-calorie choices, she creates pure and exquisite flavors that relax and soothe, using mint and herbs alongside ingredients such as ginger, which warm the body. * Photo may not represent actual product. 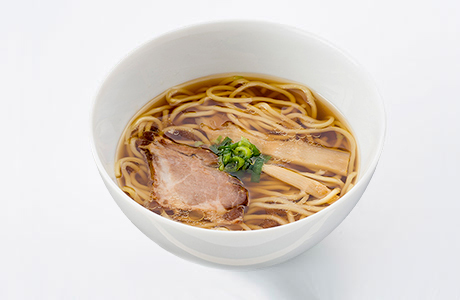 Japanese Soba Noodles Tsuta, the first ramen shop in the world on Michelin Guide as a one star restaurant, will serve soy sauce flavored Japanese Soba Noodles Tsuta specially made for JAL. Soy sauce flavored noodle uses a chicken-seafood blend broth to add richness to the taste and truffle oil for added fragrance. 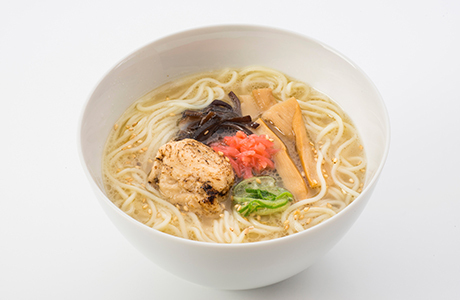 The noodles are made to enhance the wheat umami and a smooth feel down your throat. 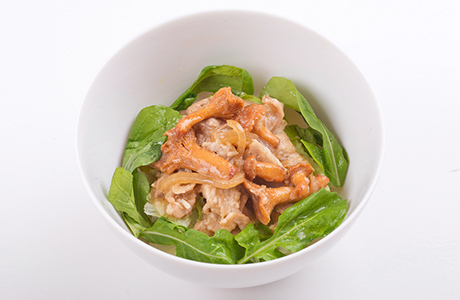 The non-fat barbecued pork is light and healthy. Flights from Japan to Chicago, New York, Los Angeles, San Francisco, London, Paris. 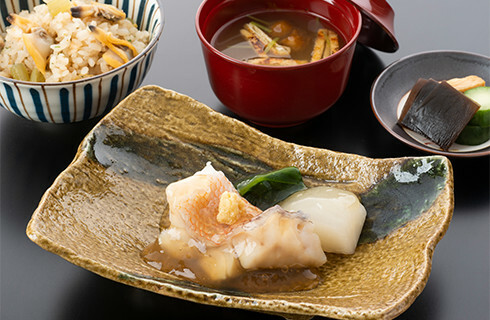 Despite a lack of animal-derived ingredients, this milky white soup with a variety of slowly boiled vegetables is finished with an umami flavor that will ensure you enjoy it to the last drop. Complementing the soup are springy noodles specially processed without using eggs, along with Yuba Roll paired with cloud ear mushroom, menma, and green spring onion actually used at Kyushu Jangara's restaurant. 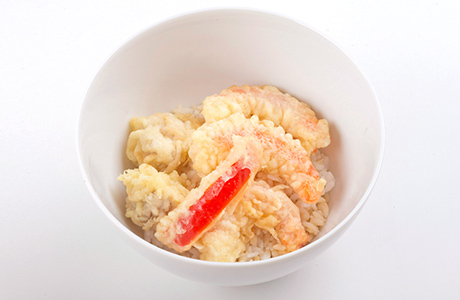 Add some red pickled ginger and sesame to taste and experience something a little different. From Los Angeles, Chicago, New York, London and Paris to Japan route. 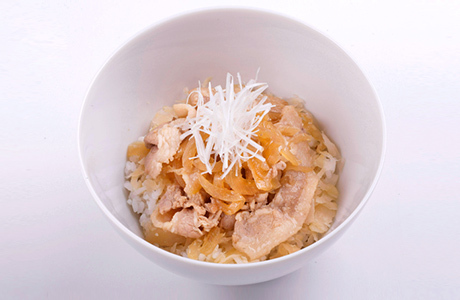 Passengers flying First Class or Business Class on flights from Europe can choose from original rice bowls unique to different regions, including the France Bowl, London Bowl, Finland Bowl, Frankfurt Pork Bowl. 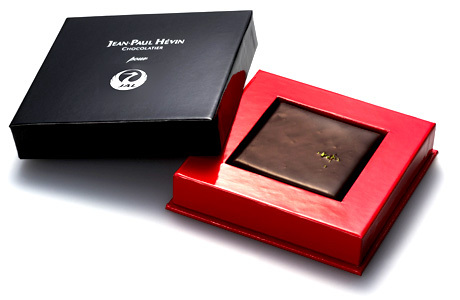 Bonbon de Chocolat FLEUR "JAL ORIGINAL"
The World best chocolatier, Jean-Paul Hevin aimed the elegance and sophistication he felt that were distinctive of Japan and Japanese people to create original flavor for JAL first class passengers. The marriage of the chocolate and JAL CAFE LINES grand cru coffee is fabulous. The delicate taste will lead you to the sweet and rich time in the sky. First Class passengers can make inflight meal reservations. 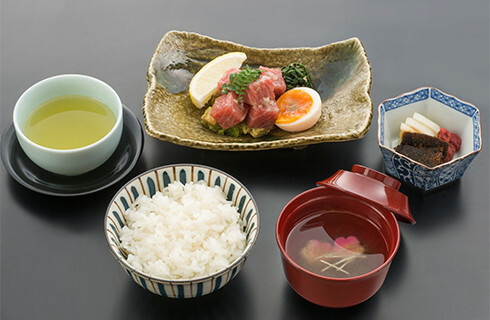 Choose from 3 or 4 options, with both Japanese and Western-style cuisine available (certain routes and first meals only). Of course, meal choices can also be made after you've boarded. 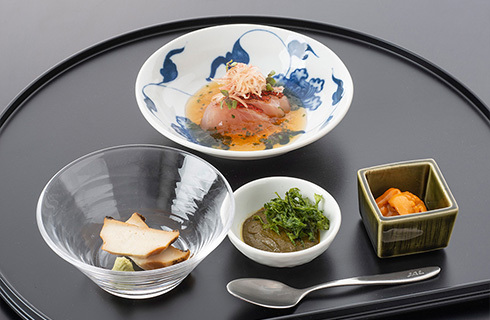 Before departure, reserve the First Class inflight meal via JAL website. 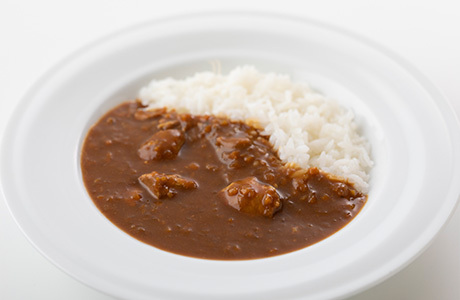 Visit the JAL website and click the "Request special meal" button for your flight on the Booking Details screen. 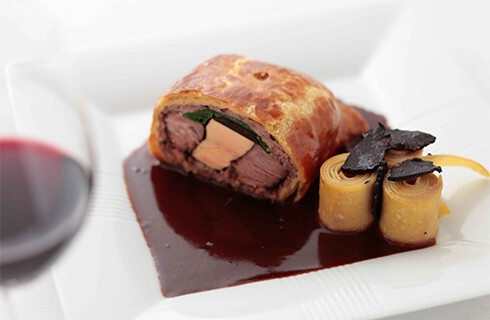 (1) Click the "Reuest special meal" button on the Booking Details screen. (2) Select your desired inflight meal from the pulldown menu, then click the "Set" button and proceed to the next screen. 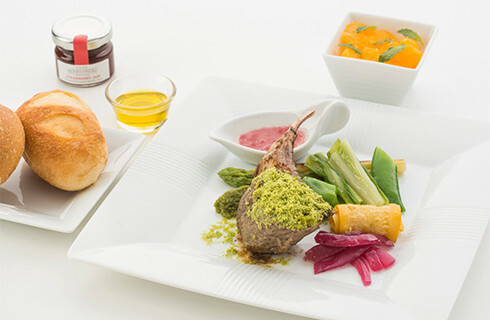 (3) The inflight meal you selected will be shown in the Flight information on the Booking Details screen. To make a change, follow the same process. *Western (Other) may vary from pork, chicken, lamb or other ingredient. *Reservation is available for the first meal. 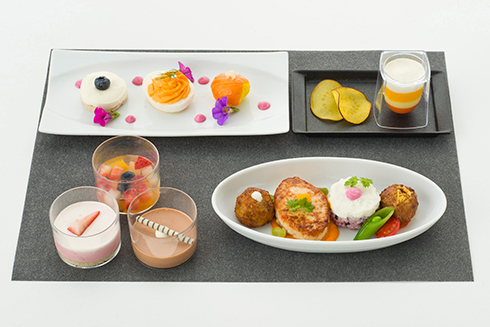 The passenger has reserved a special meal that cannot be reserved on JAL website. 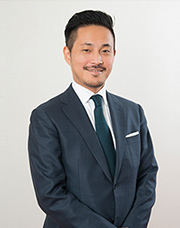 The booking was not made by JAL (e.g. by travel agency or other airlines). *1Please make a reservation after you have been informed of schedule changes. Please book your meal through your travel agent or check the menu of your flight below and submit your request online. *Reservation is accepted up to 24 hours before the flight departure time.